If you have leftover Pizza Sauce, here’s a good way to make use of it. 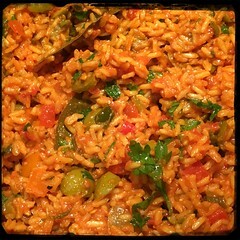 Since our pizza sauce contains both basil and oregano, we think it’s perfect for this ‘Spanish’ influenced rice. 1. Sauté diced red, green bell peppers and optional hot pepper flakes in 2 tbsp olive oil. 2. When the pepper just begin to soften, add 1 cup water and let come to a boil, add the turmeric and bay leaves. 3. Add the cup of Pizza Sauce, mix well and let come to a boil. 4. Add the uncooked, rinsed brown rice and let come to a simmer once again. 5.0 lower the heat to minimum. 6. Cover and let come to a simmer. Stir frequently and let the rice absorb the liquid. 7. Once the rice is cooked to your liking, add some lemon juice and toss in the Spanish olives. Mix well.